Tommy Bahama is a company devoted to providing merchandise that typifies “living the island life.” It’s a life without pressure, connecting with the simple pleasures of life, understanding living with the rhythms of the world. It might be enjoying the ocean, having a round of golf with friends or just vegging out at home in the comfort of your own living room. The kind of furniture that says “comfort” often depends upon the lifestyle that you embrace. If you are the kind of person that values texture and a comfortable place to lounge over making a statement or having furniture that matches, your home will have a sort of an eclectic feel to it. If you are a person who likes having things that match, colors that coordinate, or you like to follow a general decorating theme, then that desire will affect your furniture and accouterments selection. Sometimes people use their home to show their passions such as being a baseball fan or an art aficionado. Those things can even creep in when you aren’t really thinking about it – spend enough time in it and your place will reflect you. If you have a family, you might need to make accommodations for the tastes of other people. Your living room, kitchen and dining area might need to reflect combined tastes. Neutral colors, cheerful wall treatments, and generally practical items might characterize shared spaces while still giving off that supreme comfort vibe. On the other hand, you can allow the youngsters in your family some leeway in decorating their rooms, giving them a chance to express themselves in spaces that don’t have to be shared. Tommy Bahama furnishings give you plenty of opportunities to develop a comfortably furnished home that has both shared spaces and private spaces that say, “Welcome home. Kick back, and take a load off.” Good taste and comfort really can go hand in hand. Below you will find ten examples of ways that you can use Tommy Bahama decorating ideas to enhance your home. This tamarind colored table will work well on any large dark carpet adding to its décor at the dining room. Able to seat up to ten people, this table can extend up to 120 inches in length for special occasions. The legs have a turned woodcut allowing them to work with many traditional styles and candle holders on the table. This set gives a contemporary style to your room with its two over two designs. The frame is solid wood allowing it to work well on any flooring that’s light. While the gray fabrics help bring in a darker tone to an off-white wall color or darker colored table and décor adding to both. The natural finish allows it to work with a modern style. This table is great for your tropical styled room. The cherry wood color works well with outdoor themes or outdoor itself on your patio or poolside. When surrounded by light green plants, this table makes both really stand out while producing an island paradise feeling. When fully extended, this table can seat ten and give a warm feeling to any meeting or gathering. A beige sofa adds a lot to a room able to build a bright look or able to fit as that perfect contrast piece to a dark finished wood tone. The wooden support and arm panels have a palm coast color to their braided look providing a happy medium to its colors. Its bright color and shine are empowered with natural sunlight. With a dark traditional cut, this bed has a royal British design. The dark tones work well with a light room or can add flavor to a modern style bedroom with its veneer. The top post frame is able to be removed if needed or desired for added visibility. This bed is large enough for a queen size mattress to fit comfortably on it. This table is a dark wood tone with elegance and style. The base has a flat board across for those that need to lift their feet a little bit while not blocking others. The chairs match the table with their dark wooden tone and weaved mesh back and sides. This piece works well on lighter toned floors, making it really stand out clearly. The dark brown tone of this set can bring a strong presence to the room. The Canopy bed has the same tone as the other pieces and they blend together. The set comes with a number of dressers with elaborate finishing to them; each piece screams elegance and quality and can complete an empty room in no time. The coffee set is made out of very dark wood bringing a nice contrast to a light floor or marble flooring. 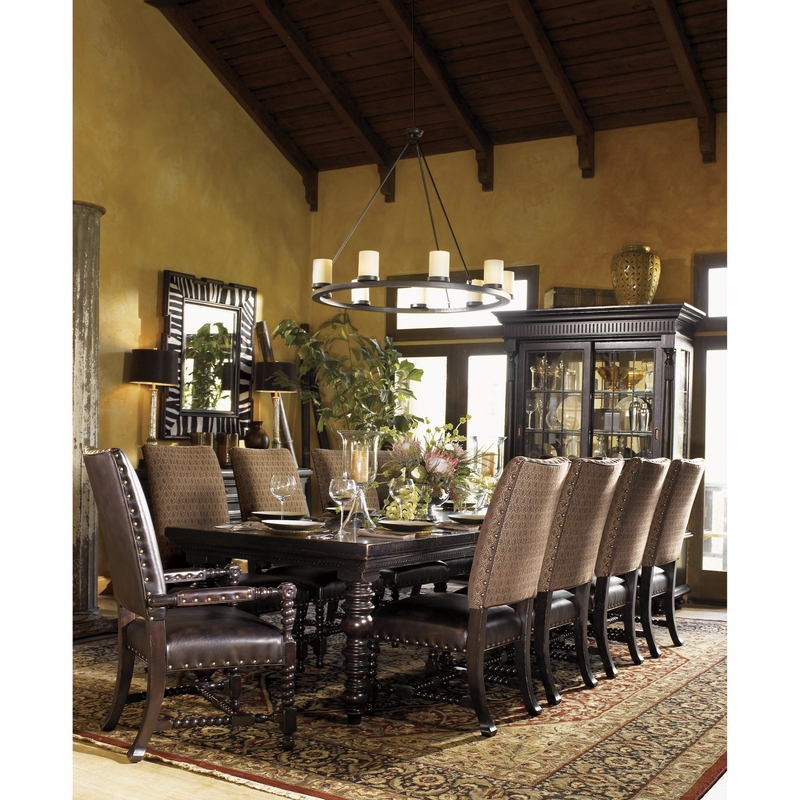 The rivets on the border give you a feel of nobility with this set contrasting the walnut finish. The end table has two drawers for added storage as well as a drawer in the coffee table itself. This maple TV stand is open with a tropical feel to it. The TV stand has a strong bamboo texture on the legs and body itself and works well with any lighter home setup. It works well if you want to brighten up the feel as well on dark wood floors. The two shelves have an open front so you can see what’s inside through the wooden doors.